1. 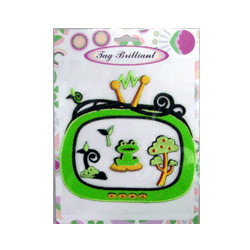 Frog embroidered sticker package, can be sticked on the garments, hats, bags, and so on. 2. Used for ornaments, promotions, or company gift souvenirs. 1. Package is including a frame and four lovely stickers. 2. Size: 14 x 19cm. 3. Fabric: felt or nylon. 5. Backing: stick-on (heat-sealed backing, plastic backing, or no backing available as well).